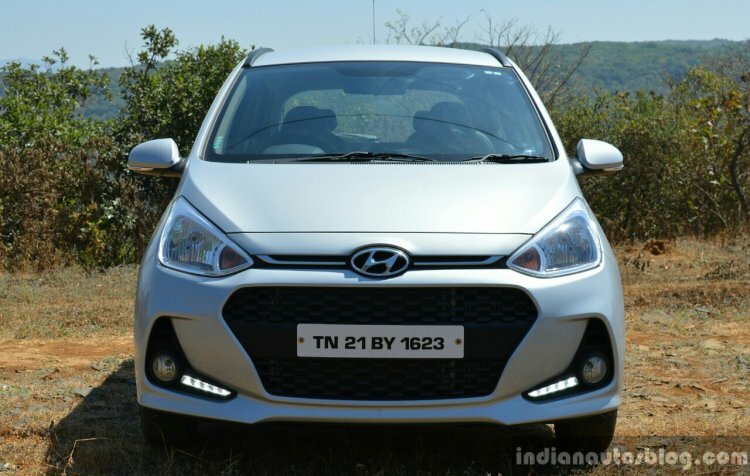 Hyundai Motor India Ltd started road trials of the next-gen Grand i10 in August this year. Recently, a test mule of the 2019 Hyundai Grand i10 was filmed driving close to a last-gen Maruti Wagon R in Pimpri-Chinchwad, Pune. Reportedly, the 2019 Hyundai Grand i10 will be launched in India in October 2019. It will be the third all-new product from HMIL, after the Maruti Vitara Brezza-rivalling Styx (QXi) and the Hyundai Kona EV to go on sale next year. So far, spy images have revealed that the new model would sport an evolutionary design, with styling cues taken from some premium cars in Hyundai's global catalogue. The front-end of the new i10 will feature a bold cascading grille. The headlights will have a more angular design while the bumper is expected to feature 2019 Elantra-like foglamp enclosures. The 2019 Hyundai Grand i10 will have a rising beltline, which should give the side profile a dynamic appearance. The B-pillars look a lot like those of the current model. As is the case with the present generation, the next-gen i10 is expected to have an extended wheelbase to suit the market needs of India. The top-end trim will ride on machined alloy wheels. The interior should be kitted out with a floating type touchscreen infotainment system, multifunction steering wheel, automatic climate control, rear AC vents and cooled glove compartment. The 2019 Hyundai Grand i10 will be underpinned by a strengthened version of the current model's BA architecture. The company is expected to use several structural reinforcements to enhance the platform's rigidity. The new model will draw its juice from a BSVI-compliant version of the current car's 1.2-litre Kappa petrol engine. The dwindling demand for diesel-powered hatchbacks, along with the high investment that will be needed to achieve BSVI-adherence, could lead to the demise of the diesel variant. The petrol motor will continue to come mated to a 5-speed manual transmission, but the 4-speed automatic unit will be replaced with the Smart Auto automated manual transmission that is available on the 2019 Hyundai Santro. Similar to the current model, the next-gen i10 is expected to get a long-wheelbase version for India and other emerging markets. Prices of the 2019 Hyundai Grand i10 are likely to start at INR 5 lakh. With a new design and interior, the Korean B1-segmenter should become an excellent alternative to the highly favourite Maruti Swift (avg monthly sales volume between April - September 2018 - 20,139 units).